I have a little bit of a shoe obsession and living in sunny San Diego, I gravitate towards buying lots of wedge sandals- perfect for warm weather dress up and feeling tall- I have many pairs! 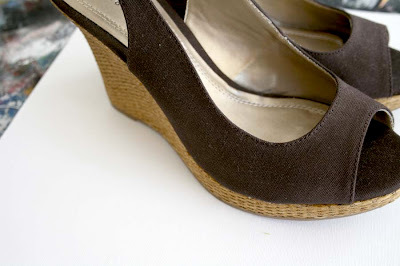 My most recent purchase was a pair of brown canvas wedge sandals (cheap and comfy!) that I thought would be perfect to alter with a little paint! I picked colors that would look nice with the dark brown background- fun but not too bright- so they could still be more of a "neutral" brown shoe. I painted lots of abstract shapes of flowers. I let the shapes dry and then added fine lines and detail. and now I have a pair of whimsical spring shoes that nobody will be wearing! Wow these are adorable!! 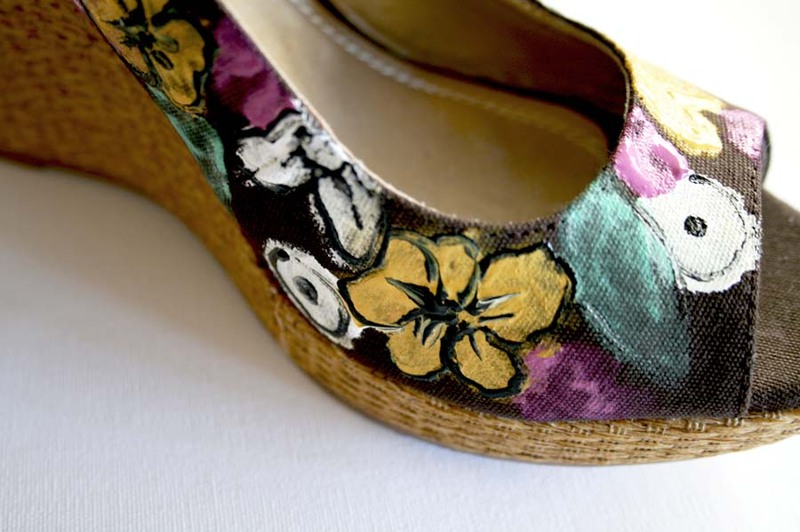 I am going to find some shoes to paint...I'm having a ball checking out all your tuturals...thanks for sharing so much of YOU!!! I love this! I also love wedge sandals! Thanks for another great idea!! Add this to my list of alisa projects i wanna try out! I would also love to know what kind of paint you used. And if its not waterproof, how could we do that? Mine will get wet here in Houston, or perhaps even just melt in the humidity, ha! 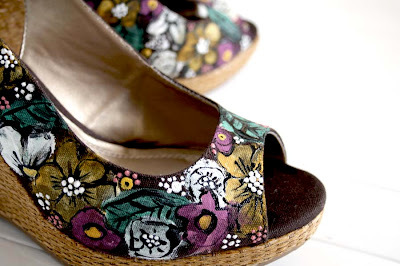 Great idea, your shoes looks so beautiful after having painted them, great choice of colors and style! Alisa, thank you soooo much for the Inspiration! Amazing. Thank you again for being so inspiring! Great shoes! So very cute! Thank you for sharing! Very cute and clever! I saw some cute suede mustard slippers at Target on clearance that I might need to try this out on...thanks for the inspiration! How coll are they!!!! I love them! I went on a shopping spree today and bought several dresses and two pairs of shoes... I won't be painting them, but one of the dresses I got is yellow with black and white paint splashes all over it. It remeinds me of one of your "messy dresses." What a neat project!! I am going to go out and get me a pair! !Thank you for the inspiration!! p.s. I live in S.D. too!! That quake was a doozy the other day!!! love it! so know what I am doing this weekend!!! don't take this the wrong way, but i'm pretty sure i'm in love with you. :))))) completely awesome heels. foot candy! i just love them! these are gorgeous! 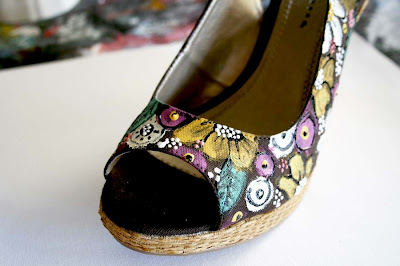 i only have one pair of wedges that I could paint, and I'm sorely tempted to grab them right now. But i'm going to find another pair. Thank you so much for the inspiration. I really love the projects you have been doing lately. Alisa, you get me every time! Here is another project to add to the roster. I adore your new wedges. very cute and such a great idea... so obvious, I don't know why I never thought of it. Canvas shoes. Canvas for painting. I just discovered your blog - have loved your work since I saw you make the cute clutch purses out of shopping bags on QATV. Look forward to reading and learning more here! Whoa... those are gorgeous! I love this idea. Thank you so much for sharing such inspirational ideas! I'll be linking. ohmygosh! LOVE, LOVE, LOVE them! My mom would adore these! She is such a shoe freak! Great idea for Mother's Day. You are so wonderful. I just found you through oneprettything.com! Can I just say, I think you're amazing!!!! I love, love, love these shoes, and your painted umbrellas and pretty much anything you do! Thank you so much for sharing!!! You are way too clever. I am continually amazed at your creativity and unique style. Okay - so I've been following you for a little while and I have to know - do you have an idea of what you are going to paint before you start? Or do you just start and see where it goes? Your style is amazing, and I just can't figure it out! You're so free, yet intentional~! I love it :) Great works! DANG those are cute! I know you'll have your own shoe line soon. I told you I was inspired! these are amazing i am so jealous! great job! i need to invest in some cute wedges. These are gorgeous! You are amazing! 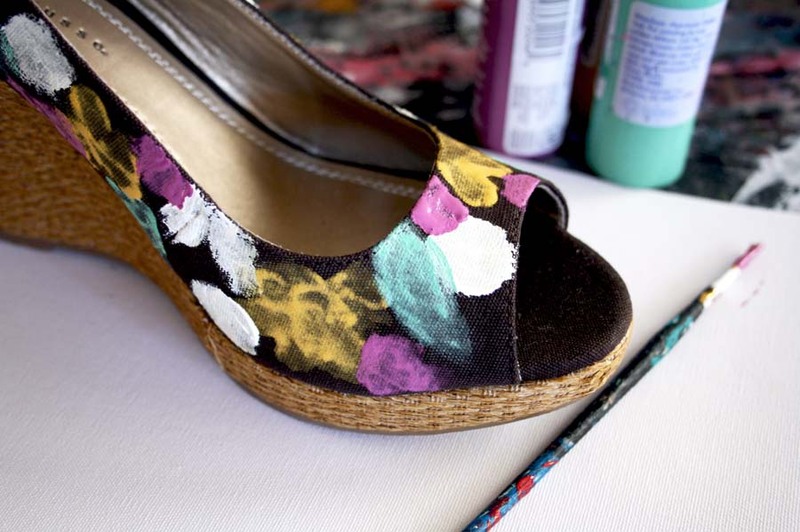 I used to paint my keds when I was in high school, but haven't considered doing this again, in years! I'm DEFINITELY going to give this a try again, this time with a sandal! Thanks for the reminder! These are awesome! What a great idea! I am featuring this at somedaycrafts.blogspot.com. Grab my "featured" button! These are awesome! I will buy them when i find. Thank you for the inspiration! Trendy and modern wedge shoes, I also want to get one, did you buy it at http://www.upere.com/? Which wedge sandal looks better?